Universally renown as the African country that hosts the largest elephant population, Botswana sets the scene for unforgettable adventures far from the more touristic destinations. 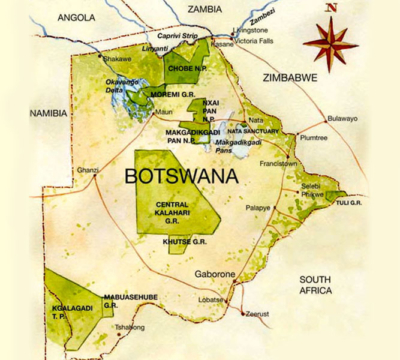 Nature in Botswana, green and rich in the northern region and desert and arid in the Kalahari and the Pans, is wild and extremely well kept, even though in the latest years some areas have opened to more mass-tourism. Mobile Safaris conducted in the northern regions of the country offer the possibility to conduct “wild camping” experiences, that is camping in wild, unfenced areas that are not equipped with running water, bathrooms nor electricity. Also, each park merges into the next, allowing visitors to live for days in close contact with nature, without seeing any sign of civilisation. Through the arid areas, however, distances can be wide and therefore transfers can be quite long. Bush lovers and “wild camping” lovers. Game-drive lovers (walking safaris as well as night drives are not allowed in the most of the Country) and, generally speaking, wildlife enthusiasts. Some of the arid destinations (Central Kalahari, Pans and Nata) are also particularly suitable for people seeking unusual sightings: desert lions, never-ending landscapes, arid-habitat wildlife, etc. Those who want to transfer only on tarmac roads. Those afraid of travelling for many days in areas without mobile phone network. Those who cannot stay for several days in a row without electricity and running water.